Imaginalis is out now...and you can buy it here. It's a beautiful Story, JMD, and I hope we'll see some more IMAGINALIS down the line. The premise was great, and I found the heart of the story to be extremely powerful, hopeful, and refreshing. It was such a Joy to read and experience. So many deep and beautiful themes woven together, without shying away from the more 'dark' sides. To bring hope, wonder, and joy, while not shoving sorrow, loss, grief, and fear under the rug, takes a special touch. I found that touch in the writing of this book. (And the format of the book was quite beautiful as well. Those few well-placed embellishments made it a wonderful package fitting for the content). I've purchased 4 copies already, 3've been donated and 1 is gonna be headed your way in hopes of gaining additional 'writing'. Writing this comment was so fun, I'll hafta go add a review to amazon.com. Something I've never done before. On a side-note, I noticed the article here http://www.comicbookresources.com/?page=article&id=27876 about your upcoming "Chaos War: Thor" for Marvel. Looks amazing, too. The THOR gigs came pretty much out of the blue, David and it's been great fun working on the character. When I was a wee lad, at the height of the Lee-Kirby collaboration, THOR was the best book on the stands. I think Judas Traveler is here in my office somewhere. Maybe under the desk...? The book means the world to me, Tim, and knowing how much you enjoyed it -- and that you understood and appreciated my intentions for the story -- well, words can't express my feelings. And the fact that you actually went out and bought FOUR COPIES (!!!! )...well, gratitude doesn't even begin to cover it; but I'll say it anyway: profound thanks! And, yes, PLEASE add your comments over at Amazon. Getting a book noticed in this marketplace, in this economy, is a difficult thing...and every little bit helps. So still more thanks for spreading the word! Happy New Day right back at you. My first real experience with Thor was Dan Jurgens' celebrated run in the mid 90s. It involved Thor's merger with a different human host, and it was a great ride. BTW, I highly recommend the Marvel animated film HULK VS. THOR. As a fan who grew up in the 80s and 90s, I'm happy to see some 90s concepts dusted off and refined. I think Judas Traveller had a strong start, but he got bogged down in the chaos of the later Clone Saga and a 'pass the baton' writing approach. While I understand the argument that Judas Traveller doesn't fit in Spider-Man's world, I've never bought it. It seems to me that "Raskolinov meets Dr. Strange" is the perfect fit for a hero obsessed with power and responsibility. Hope you find Judas Traveller soon, JMD, or he finds you. He'll make it back eventually, and maybe ditch the Host while he's at it. Just found Imaginalis at my local Border's store in Manhattan, in the interestingly titled "Independent Reader" section. "Why yes, I feel quite indie browsing wares at Borders on Wall Street, thank you!" All kidding aside though, can't wait to delve into the novel. As the architect of a multitude of my favorite comics growing up, such as Brooklyn Dreams and Moonshadow, I try to hunt down everything you write. Looking forward to new Marvel stories from you! Read and enjoyed the book. Haven't had time to write anything about it yet, but I plan to within the next few weeks. Also just got a copy of DOCTOR STRANGE: INTO SHAMBALLA, which I'm looking forward to. The art looks nice, I don't think I've seen Dan Green doing full art before, just as an inker. Very glad you enjoyed the book, Bob -- and any positive review you can add over at Amazon (or anyplace else, for that matter) will be profoundly appreciated! Funny you mention INTO SHAMBALLA: I just had lunch with Dan Green yesterday. Yes, most people know Dan as an inker, but he's an amazing artist and storyteller. It's a shame he doesn't do it more often. And when we merge the so-called real with the so-called imaginary, all bets are off! 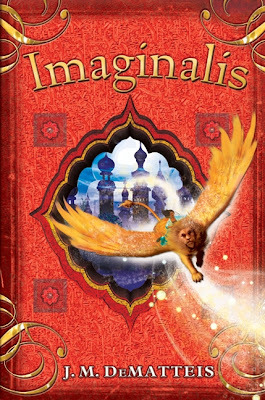 Yesterday was my birthday, and my mother got me an Amazon Kindle, and my very first purchase for it was Imaginalis! Well, J.R., I sincerely hope that, when you've finished the book, you feel that it was money well spent. In any case, thanks for your support: VERY much appreciated. That's GREAT, J.R. -- thanks so much for sharing that! No idea if you'll ever see this comment, but ah well. I just read Imaginalis and enjoyed it, particularly Pralaya's comments about being a "necessary evil" (no pun intended). It made me think about what a fantasy type story would be like without evil forces and such spoiling all the fun. I mean, a lot of the fun of the Harry Potter stuff comes from all the neat little bits at Hogwarts. Do we really need Voldemoort spoiling the broth? On the other hand, while one book would be fun, 7 might seem excessive and Harry's wonderment of Hogwarts partially comes from how miserable his life was prior to going there. Huh. Regardless, the biggest feeling I got from reading the book is that I didn't do it right. This didn't feel like a book that I should have gotten from my local Barnes and Noble. I should have found it when I was 10, tucked away in my Grandmother's attic (sans dustjacket of course) and started to read it there, only stopping when my mom came up, concerned that she hadn't heard a sound from me in too long of a time. Alas, 10 was quite awhile ago and my Grandmother never had a house with an accessible attic, so I guess I'm stuck with what I got. Better for your bank account anyway, right? Well, David, I hope you were at least able to climb into an attic in your own mind while you were reading the book. Mental attics are always accessible. Thanks for you kind words about IMAGINALIS...and thanks for picking up one of the key points of the story: our dependence on the whole notion of "villains" -- as well as our need for violent solutions to their so-called villainy. I really wanted to leave people thinking about that, but, oddly, not that many folks have picked up on that element of the story.